This is currently in the development permit application stage, but construction is expected to start sometime in 2019. 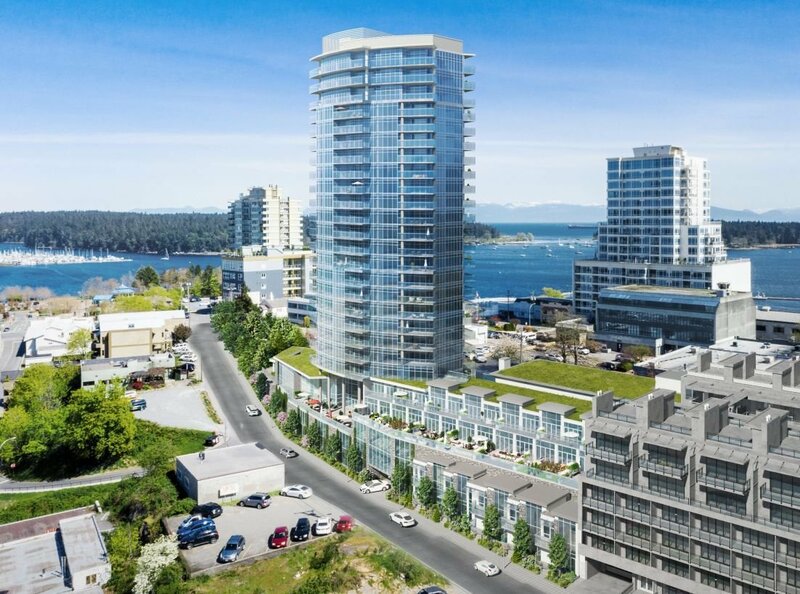 It will be a beautiful highrise development with some townhomes and commercial spaces around the base, at 77 Chapel Street in downtown Nanaimo. This helps to move forward the vision of downtown Nanaimo as a place where people LIVE, once again. Once this is built, there will be four newer condo complexes nearly in a row: Studio NA, 91 Chapel, Marcielo, and (staggered from the rest) Aqua Residences. And according to the rendering shown below, Marcielo is going to be a fine-looking, luxurious addition to the landscape. Pre-sales haven't begun as of this writing, but contact me if you'd like to be notified when pre-sales begin. The developer has indicated that buyers will need to pay a 10% deposit upon signing the contract, then another 5% later, then another 5%. Rentals and pets are going to be allowed at the outset, though the strata members could vote to change this in time.